Typically a post like this would live over on The Adventures of Josie & Edie but as I don’t plan on any gift guides apart from this one and maybe one celebrating small business it felt right to hit publish over here. By this point, we’re all well aware that I’m utterly obsessed with my sighthounds Josie & Edie. And subsequently something I’m very passionate about it good houndwear in general. As the festive season is edging closer and closer than that means only one thing, a purchase for your pet must be made and here are some things that are on my list. All of these stores and services are small businesses which I’m excited to be able to support this season, as there is nothing better than seeing where your money goes. Whenever people ask my recommendations for dog jumpers than my automatic answer is Redhound For Dogs. From jumpers to snoods, to striped tees and finally their wonderful regal coat collection there is absolutely nothing you cannot find at Redhound for a sighthound. 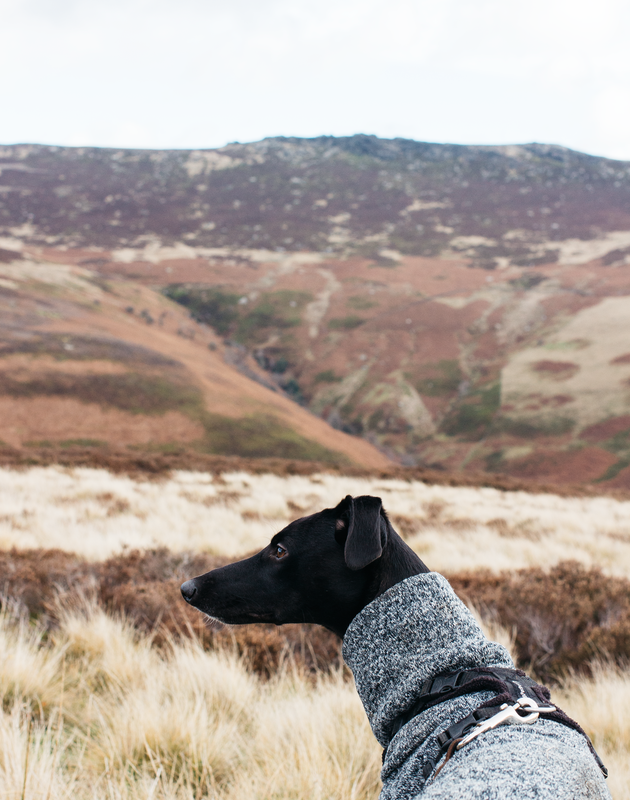 Debbie, the founder of RFD has been a lover of the breed since childhood and understands the contours of the sighthound body that need to be catered for and considered when it comes to outerwear. My biggest need for my hounds is that I need something that they run and get absolutely filthy in but are still kept snug and secure and that is exactly what the Redhound fleeces are, they’re hands down the best in their wardrobe and something I know I can depend on. The customer service and guidance that Debbie offers is outstanding, she catered to Josie’s long but slender body without hesitation and has always been there to soothe my anxious dog parent mind when we discovered Edie couldn’t eat poultry. Since discovering that Edie couldn’t eat any poultry and removing it from both of the dog's diet entirely something I’ve found ridiculously hard is trying to find treats for them. And when I turned to Instagram in search for help there was one place that everyone suggested and that was Devil Dood Direct. Ran by Emily and the help of her three dogs (she recently became a whippet parent) DDD sells everything from enrichment toys to raw food to the best treats out there. Although I’m constantly buying the girls treats there is no better time to stock up than Christmas and what I think is great about this little store is that there are Deli Boxes where you can try a little bit of everything to see what your dog likes. For a hound about town and one that doesn’t spend their time rolling around in something questionable then Poppy & Ted is an absolutely adorable brand who caters for smaller dogs. There are so many sweet designs it’s hard to pick a favourite but the cactus, constellations and the whales are certainly a stand out to me. I’m hoping that the creator of the wonderful brand Paige ventures into martingale collars soon as they’re too cute for sighthounds to missing out on. Although there are many dog owners out there who only care about practicality which is, of course, important I can’t deny that I love anything with an element of fun to it as well being fit to purpose. And that’s exactly what Poppy & Ted is to me. This is one more for the dog lover than the actual dog although there are collar charms available which are something I’m currently eyeing up. You might have seen my little whippet pins on my Barbour jacket lapels and they are some of my most valuable possessions as they're modelled off my own little hounds. Elaine creates beaded sighthound pins and all of the proceeds go to various charities which is absolutely incredible and such a wonderful way to give back charity. You can either purchase an existing design or get something custom of your dog and it’s not just sighthounds on offer either. These sweet pins make the most amazing gift for an dog lover and something that I know I’ll wear forever. The hunt for the perfect dog coat is something that I feel like is never-ending. I’m yet to find the perfect one for my hounds, they’re both not quite your standard hound size and it can make buying anything difficult. And if you follow the girls Instagram then you will be all too aware that Josie & Edie love to zoom in the woodland so anything too fancy is off limits which is why this brand caught my eye. The coats are beautifully designed but practical too which is exactly what we need. It’s not quite like anything else I’ve ever seen and there are so many options of coat style but also colour combinations. Naturally, I’m drawn to the soft mauves, pinks, and greys but who can deny a yellow raincoat? The brand is a small startup based in Norway and one I’m excited to follow along on their journey. WHERE ARE YOUR FAVOURITE PLACES TO SHOP FOR YOUR DOG?